I love the bánh mì. 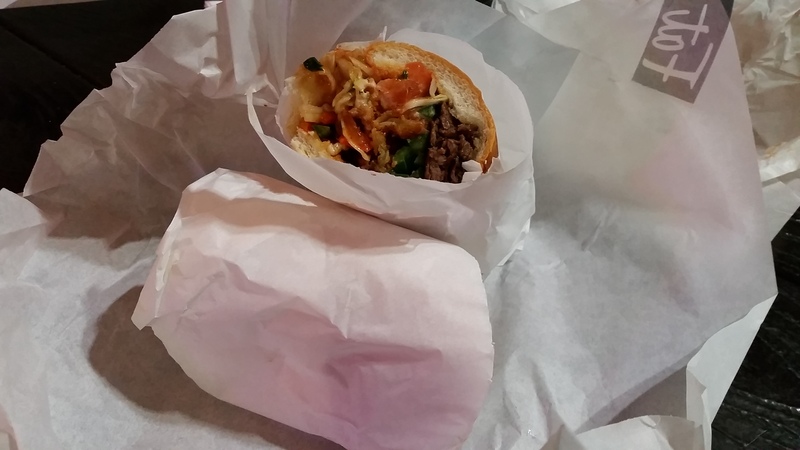 A bánh mì is the reason this blog exists. There are 28 separate bánh mì reviews on this site. If there’s someone who’s been to more bánh mì places than I have, they aren’t blogging about it. So when I look at the above…it’s wrong. Marinated steak, pickled vegetables, a spicy coleslaw, fried onion rings, tomato, jalapeño, cilantro, a teriyaki glaze and sriracha mayo. That’s a far cry from what I know the bánh mì to be, what with the onion rings, the tomato, the coleslaw, the teriyaki. It’s just a mishmash of pseudo-Asian ingredients and the sort of fried indulgence for which Fat Sal’s is known, and they have the gall to call it a bánh mì. Teriyaki?!!? The thing is, I’m not sure I care anymore. This was a good sandwich.. Sweet, spicy, tender and crunchy and really just balanced from top to bottom. I’ve held fast to dogma for a long time, claiming to be some arbiter of something I didn’t invent and can’t claim to fully understand, and maybe it’s time to be done with that. There’s room in this world for the pure experience, but there has to be room for the rest of it, no? This was a really tasty sandwich, and maybe that’s the last word. This entry was posted in A Month of Bánh Mì, Sandwich Reviews and tagged Banh Mi, Beef, Los Angeles, Reviews by Pete, Sandwiches I Have Eaten, Westwood by Pete. Bookmark the permalink.